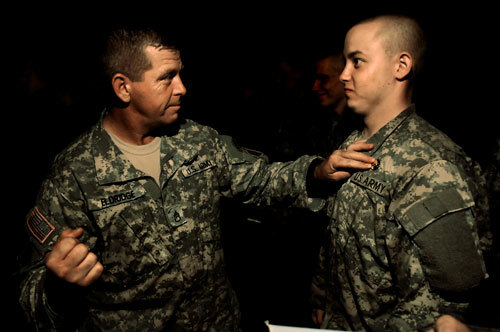 Fisher braces for his crossed-rifles pin, signifying his completion of training. Drill sgt. Eldridge holds the pin in place and prepares to secure it with a fist. "I hit him square on the chest," Eldridge said. "He had two holes, and blood dripping down from each - 'blood rifles.' "
Ultimately, 13 weeks of basic training led Ian Fisher to this - a 10-mile march through a series of high stress combat tests that would end at a place called Honor Hill. A sergeant closes the ceremony, "You are now the guardian of freedom and the American way of life! - A warrior!"